“Our Blue Ox tow bar and baseplate helped to save our lives after a tire blowout on our motorhome. We walked away from this without a scratch and we are definitely Blue Ox believers!" -Francis and Shirley, Long Beach, Mississippi. Learn about Blue Ox's family of products available for purchase through Lichtsinn RV! Our Winnebago Parts Team has over 50 years in combined experience helping customers with Winnebago RV Parts. They are experts at helping you find the right part for your RV and fulfilling your order quickly and efficiently! 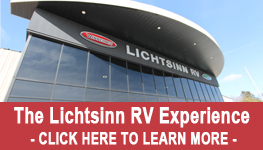 Contact the Lichtsinn RV Parts Department at 1-800-343-6255 for more information.